Former Deputy Chief of Staff under president George H. W. Bush and Chief of Staff under president George W. Bush, Andrew Card’s job was to inform the president of information that he needed to know, not information that he wanted to know. And when he needed to interrupt president Bush during his visit to Booker Elementary School, he knew the news was not any that Bush wanted to hear. 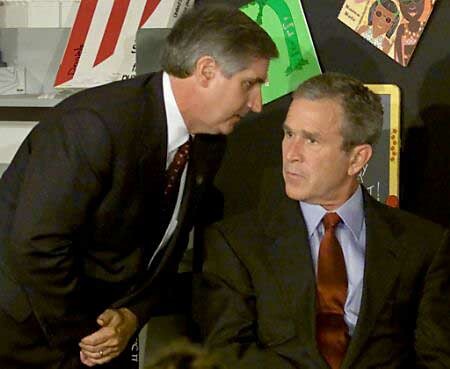 “America is under attack” were the words that Card was so famously photographed whispering to Bush after the second New York City twin tower was hit by a plane hijacked by terrorists. After initially believing that the first crash was a “horrible accident,” Card instantly knew who was behind these attacks. Despite the shock of these tragedies, Card and Bush could not let their emotions get in the way of keeping the country stable. They needed to stay disciplined – in a cool, calm and collected manner. Clearly realizing that the president was highly impacted by the situation, Card knew that Bush was focused on the unique and lonely responsibility of being the president of a devastated America. Although Bush was in such a difficult position, Card watched him bring resolve and faith to the situation, something that Card admired him for.